For a list of fish and their locations, see the Fish page. 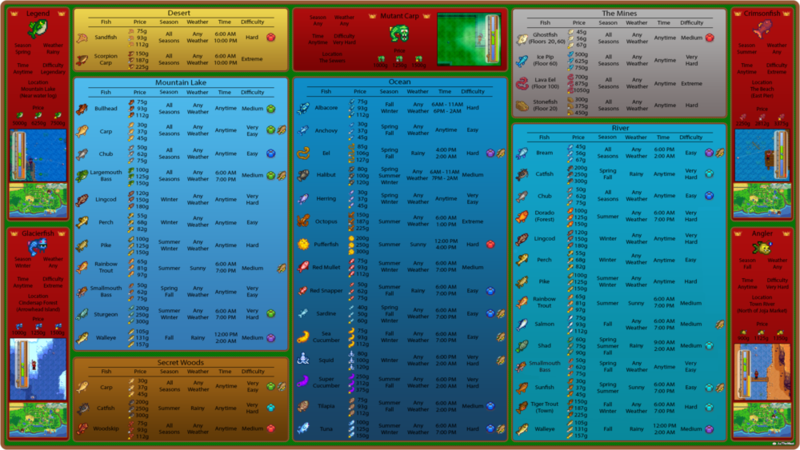 This page provides fishing strategy information for Stardew Valley. The quality of fish rises the farther the line is cast from any walk-able area. In addition to the following spots, its generally known that darker parts of the water or water with a log in it (the Mines Lake, Cindersap forest lake) tend to produce quality fish. For example: in the river in the southwest part of Pelican town, you can hit the dark water area and come up with gold fish most if not all of the time. Some of these locations are also the exact locations for the legendary fish. Below the path on the right of Jodi's house. Western pier. Cast near the rock. Where the river meets the ocean (in the middle of the river mouth triangle). Cast at an angle into the dark blue water from either side. Eastern pier (across the repaired bridge). Cast down or left at the end of the dock. Below and six tiles to the left of Leah's door. Island near the hat shop. Southwest edge of the fence past Robin's house. Southern tip of the second island, also accessible from the area near the broken bridge to the east. According to the game file, a fishing spot is not divided by ocean, lake and river, but by the maps. For instance, the river south of Leah's house is not the same as the river in town. Note that special fish are not included in the below tables. These special fish are the 5 Legendary fish and the 4 Mine fish. 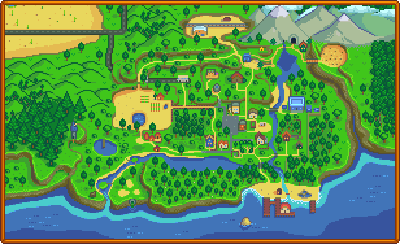 Note that there are two fishing spots in the forest, the pond in the middle and the river to the south. Note that this refers to the lake outside of the mine. Note: Catfish can not be found here in winter. The Sewers are an easy and productive fishing location, especially to level up the fishing skill or farm treasure. Carp is the least difficult fish to catch in the game and it is the only fish in the sewers (except for a single Legendary Fish, the Mutant Carp). Therefore, every cast of the line results in either an immediate item reward or a quick Carp catch. This makes the Sewers an ideal place to fish for treasure since Carp are unlikely to escape. Since carp and algae are the only possible non-treasure catches, your inventory will not become clogged with other fish, unlike at locations with more diverse fish stocks. Through the sewers. Can only be accessed end-game, after picking up the quest Dark Talisman. Through the cave behind the train platform. Can only be accessed end-game, after completing the quest Dark Talisman. This page was last modified on 19 August 2018, at 13:09.